Card games and betting often go hand in hand, and casino or online play poker have taken the world by storm. Televised events regularly offer prize pools worth hundreds of thousands, and poker professionals occasionally scoop multimillion wins as if it were casual. The popularity has led to the development of many variations, aside from the traditional types of poker like Texas Hold ‘em and Omaha. As a result, online sites, especially, are in a race to make the most innovative game. One format to come out of the online boom is a fast-fold poker known on the 888 platform as SNAP poker. This variation centres on the same rules of Texas Hold ‘em but with one big twist: when you fold, you are instantly seated at the next available table and dealt another hand. It’s poker, but much faster! As mentioned, SNAP poker is a fast-fold format available at 888poker. You can play it both as a cash game and as a tournament, and it is available at many different buy-in levels. When a player folds, they are randomly seated at a different table and dealt a new hand. The SNAP fold button even allows players to fold before their turn and move straight on with the next hand. Other players will not see the fold until it is your turn. In cash games, there is also the option to fold and watch. That means you can move onto your new table and get a new hand but also, watch the action of the hand you recently folded. The folded hand will pop up on a new screen for you to observe. The basic idea of SNAP poker is that you play a lot more hands. You don’t have to sit around waiting for a decent hand for a long time. You can fold and move on. You can probably play around 3–4x more hands per hour in a SNAP poker game, too, compared to a regular cash game or tournament with a similar structure. It’s also easy to join the games from your lobby. SNAP is appealing for recreational players who want to be involved in action but also want to bet with a big hand. It allows you to jump right in and play fast, which is also good news for anyone on a time limit. But what about serious players? Is there any strategy that can help you to win these games? 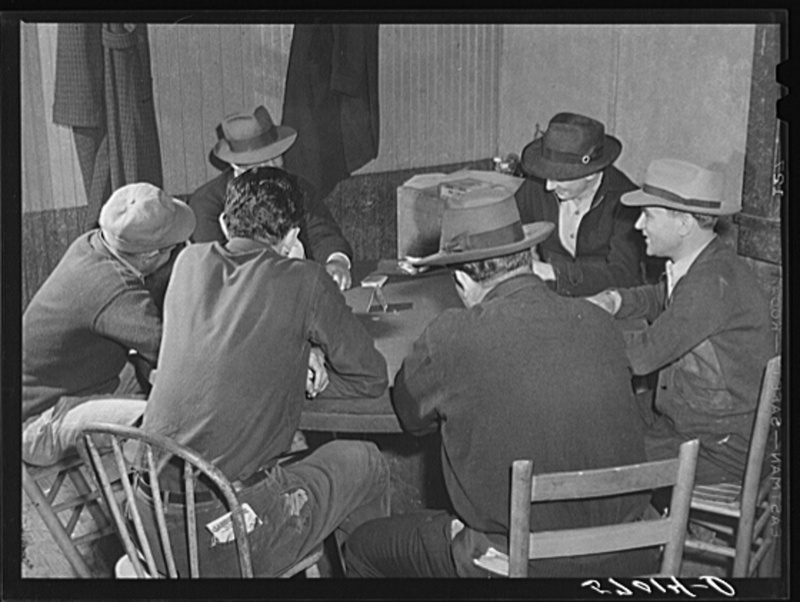 A SNAP poker game in play. It’s critical to get to grips with the key differences (and similarities) between a standard Texas Hold ‘em poker game and SNAP poker to understand what strategy to use first. You move a table after every single hand. You, and other players, can fast fold. These differences create changes in the dynamics at the poker tables. The main differences to remember are the fast-fold and table changes, which mean that there is less information to use. Poker is already a game of incomplete information. You don’t know what your opponent holds, so you aim to fill in those gaps by observing how they play, making notes and perhaps using your poker HUD to record statistics. 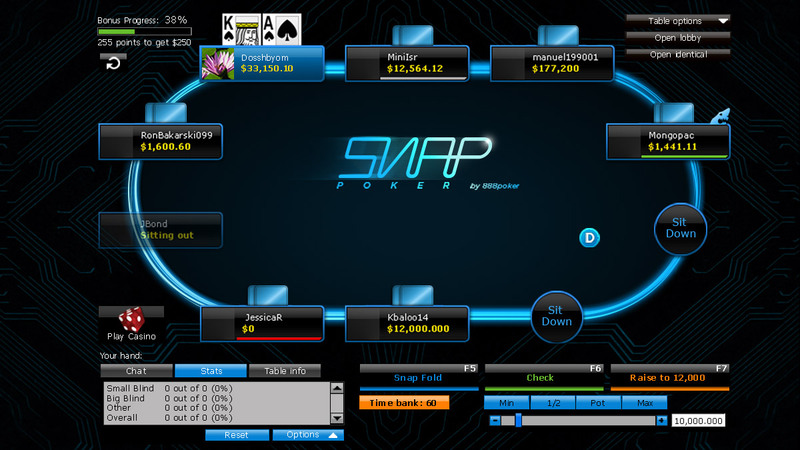 In SNAP poker, you will not get the luxury of watching your opponents over multiple hands, as they will move a table. By the same token, they do not see as much information about how you play. There is little in the way of history and even less in table dynamics and hand reading. To put this into perspective, let’s say the player pool is 500 players in a SNAP tourney or ring game. The tables have nine people on them. On average, it will take you 55 hands to see the same player again (500/9). So, if it takes you 20 hands to get any meaningful read on a player, you could be waiting for 1,000 hands for this to happen in a SNAP game. How do you adapt to this information gap? The answer is to play a more basic game based on mathematics and make the right plays against what are unknown players. You can also exploit the fact that the other players can’t make a read on you. Finally, you can also take advantage of the fact that more people will be fast-folding pre-flop as well as post-flop if they run into any trouble. Make optimal plays based on mathematics and rely less on your ability to read other players. You don’t have to worry about making complex plays (apart from in late-stage tournaments), levelling opponents, mixing up your play, balancing your range or getting creative with your betting. All these will be unnecessary and ineffective without any history between players. Play ABC poker for the most part. Don’t only fold waiting for premiums. That’s what everyone else does. Exploit the fact that everyone else folds by making small, selectively aggressive plays, such as stealing blinds, C-betting the flop and three-betting pre-flop. Play fewer tables of SNAP poker to make up for the speed. Even multi-tabling a few of these games can be too fast for most players. Expect a lower win rate than the equivalent standard format game if grinding, but remember, you can put in more volume per hour — even with a lower win rate, they can be more profitable. Without the information of hand reading and observing opponents over long periods, you must rely on the other factors that are still left. They are: your starting hand, position, number of players in the pot, opponent’s position and their betting pattern over the single hand. I hope that these tips are useful when playing fast-fold format poker games like SNAP poker. The basic idea is to use your best ABC maths-based poker strategy and consider the information gap. Use it to your advantage by making simple aggressive plays. Your opponent will have no idea that you have raised the button 20 times in a row! Have fun, and happy learning.